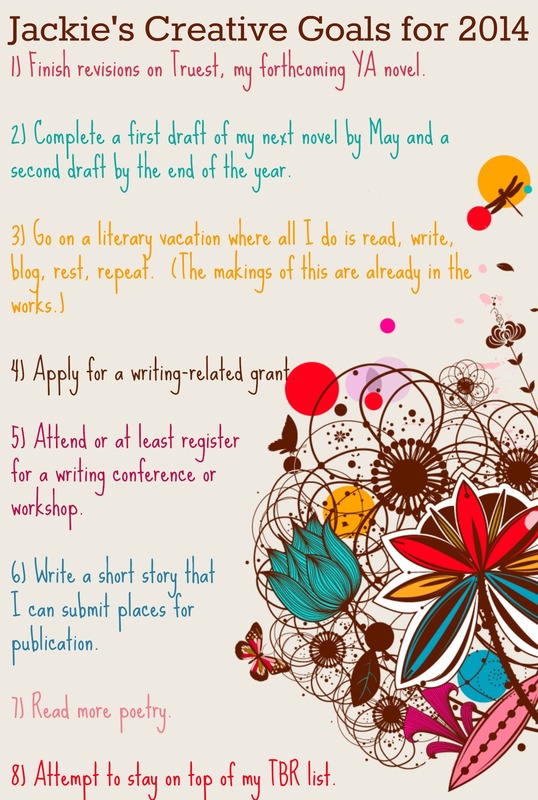 This entry was posted in creativity, novel, reading, real life, writing, YA and tagged jackie lea sommers creative goals for 2014, my creative goals for this year by Jackie Lea Sommers. Bookmark the permalink. Worthy goals, all. And a very creative way to present them. I pray all goes well. Thanks, Tony!! I feel bright-eyed and eager to attack them! Thanks so much, Therin! Stop by the blog again. 🙂 Just checked out yours– you’re so prolific for your young age! Thanks KE! A friend and I are going to a cabin in Wisconsin this summer (can’t wait! ), a couple local grants (it’s unlikely I will get one or the other), and SCWBI in August! SCBWI LA? I’ll be there!!! Fun!! I think Kristin (from the Big Sur workshop; remember her?) and I are going to go together! It will be lovely to see you! Hooray! We totally need to meet up! I may even try to stay in the fancy hotel this year…with a bunch of people in the room to cut down costs! Brilliant goals 🙂 I love that you want a literary vacation. What a great idea! I hope you achieve your goals! Did you draw those yourself? BEAUTIFUL!! All the best to achieving your resolutions! Great goals and beautiful stated (as always)! Good luck writing.